A MTB helmet needs to be robust as off-road sports requires proper protection for the head. 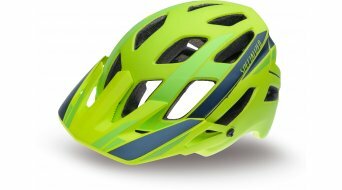 But a mountain bike helmet also needs to be lightweight and well ventilated, which is imperative. A heavy, uncomfortable helmet would make the cyclist want to go on a bike tour without wearing a helmet. However, a helmet should achieve exactly the opposite. It should fit the shape of your head optimally and not bother you while wearing it. 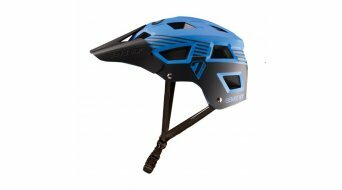 Thanks to adjustable straps and an adjustment option at the back, you can adjust almost every mountain bike helmet until it fits perfectly. A good ventilation via the air channels that run through the helmet ensures a consistent air flow all around your head, because in cycling, the head is particularly prone to excessive sweating under the bike helmet. MTB helmets typically have a (often removable) short visor at the front. Not only does this give the helmet a more sporty look, it's above all an additional sun and dirt protection. Especially in the forest, a mountain biker has to deal with changing light conditions and mud. Here, the more roundish dirt helmets that are similar to helmets for skaters, belong in the MTB category as well. These half bowl helmets are a little less delicate since they need to withstand actions like when jumping and bouncing cause the dirt biker to tumble off his bicycle. 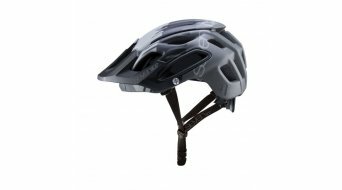 Nowadays a typical MTB helmet consists of foam with a thin plastic coating. The manufacturers of MTB helmets offer a variety of shapes and colours and thus something for every mountain biker. And of course this includes special helmet models for women. Here you'll find all the helmets that provide optimal protection for mountain biking. IXS, Bell, Met, Specialized, Giro and even more top brands are waiting for you. Ellbogenschützer sind die mit am häufigsten eingesetzten Schützervarianten für MTB-ler und Enduro-Biker. Wir haben die Schützter für die Bereiche Handgelenk, Ellbogen, komplette Armschützer und Schützer für den Schulterbereich in dieser Kategorie hier zusammengefasst. Auch Kinderprotektoren für die Ellbogen sind hier aufgeführt, damit schon die Kleinsten optimal bei ihren turbulenten Bike-Erkundungstouren geschützt sind. Die meisten Schützer (engl. Guard genannt) sind mit einer Klettfixiereung schnell angezogen und fixiert. Auch preislich ist für jeden das Passende dabei, die Unterschiede im Preis liegen hier meist am Materialeinsatz. Es gibt leichte Schützer, welche mit weichem Schaumstoffpolster auskommen oder solche Protektoren, die mit Kunststoffschalen am Ellbogen und Schulter für härtere Einsätze auf DH Strecken gemacht sind, wie es die Profis nutzen. Einfache Ellbogenprotektoren sind also entsprechend schon um 15 Euro zu haben. Wenn sie mit ausgereifterer Technik überzeugen, können sie auch schnell bis zu 100 Euro kosten. Zum Beispiel ist hier das neue Material „VPD“ aus dem Hause POC, welches sich als ursprünglich weiches, angenehm zu tragendes Material erst beim Aufprall verhärtet. Troy Lee Designs, iXS, Dainese, POC, Leatt, ION... die Palette der Top-Marken auf diesem Segment ist groß und sie alle findest du hier online in unserem Angebot rund um Armprotektoren, Ellbogenschutz, Handstabilisatoren und Co. Since concepts such as suspension travel and downhill suitability have now begun to arouse interest among potential buyers of virtually all bicycle categories, equal importance must be placed on providing adequate protection. Knees and shins are exactly where you need protection when you are out and about cycling! 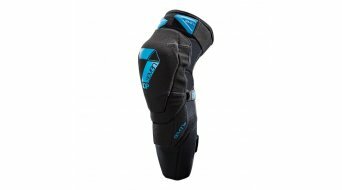 Knee and leg guards are the most common type of protection in MTB sports. Manufacturers of MTB protective gear have adapted their products to the all-mountain and enduro sectors. Whether it be comfort, fit or price, today there are no more excuses for not using knee and shin guards. Our protective gear come in two kinds: there are soft knee and shin guards, some of which use materials which harden on impact in the event of a fall, and there are protective guards featuring hard-shell elements. 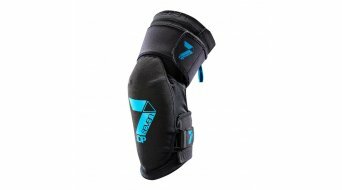 Both kinds are available as knee guards or as knee/shin guards. Gear that protects the knee only is often referred to as knee guard, hard-shell knee guard or kneepad. The slightly longer version not only protects your knees but your highly sensitive shins too. . Whichever gear you end up choosing, your decision should be based on your intended use. Let's say you are out cycling with a backpack. You've got a long climb ahead of you before heading downhill on a trail that may be full of roots and other such obstacles. In this case, it might make sense to put on your knee/shin guards only after reaching the summit. Having your backpack with you also means that you can easily store your protective gear. This also means that you are free to choose from practically the entire range. Bikers who love riding in bad weather and snow should make sure that their leg guards can be opened completely. Otherwise you'll end up having to take off your shoes each time you want to put on your guards. For enduro bikers, we recommend using soft knee guards. You can easily slip these down on uphill stretches. If, however, you're heading for a bike park, you'll need maximum protection. In that case, we highly recommend using a robust knee/shin guard. Finally, while pedalling make sure that the gear doesn't pinch or chafe you and that the guard doesn't slip out of place. This is why you should never go on a cycling holiday without having tried on your knee/shin guards beforehand! We carry knee guards, ankle guards, and shin guards. You are sure to find exactly what you are looking for at our shop - and at a great price, of course.